Christine Ockrent is one of France's best-known journalists. Her career has included work for two American television channels, all three major French channels and magazine editing. She presented several prominent morning and evening news shows on both television and radio and anchored France Europe Express for more than 10 years. She was Editor-in-Chief of L'Express and has written for Prospect and The Guardian. 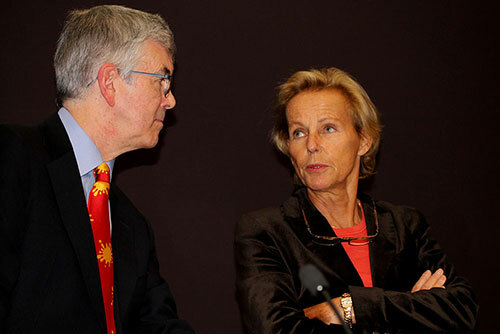 Last week she spoke to an audience at City University London for the 2014 James Cameron Memorial Lecture. Her talk examined the changing landscape of journalism, touching on the evolving relationship between readers and editors; the rise of citizen and brand journalism - the latter blurring the lines between public relations and journalism; shrinking news rooms, the expansion of freelance reporting and the rise and adoption of new technologies. You can read her full transcript here. Commenting on the lecture, Professor of Journalism, George Brock said: "We were proud and delighted to host Christine Ockrent as the 2014 Cameron lecturer and her lecture was a magisterial survey of what is happening to journalism now - all the better for being delivered from a continental perspective." In addition to Mme Ockrent's lecture, the evening was also the platform for the presentation of the 2014 James Cameron Award. The award was presented by Professor Brock and was awarded to a journalist "who writes and thinks in the James Cameron spirit - that is to say original, eloquent, iconoclastic, perhaps somewhat rebellious and wide-ranging." The 2014 recipient was The Guardian's foreign correspondent Luke Harding. Harding was recognised for his work on Russia, Ukraine, Edward Snowden and Wikilieaks. After receiving his award from Professor Brock, Harding tweeted his thanks, "Deeply honoured to have won the 2014 James Cameron Memorial Award. My thanks to @cityjournalism and @georgeprof #CityCameron14." A special award for perceptive writing was given to the Financial Times' Edward Luce. An alumnus of City Journalism, Luce is the Financial Times' Chief US commentator and is currently based in Washington so was unable to collect the award in person. His editor, Ben Hall, received it on his behalf.